BoardGaming.com> Games> Board Games> Space Sheep! You will issue Tactics to the Shepherd Fleet to direct the Rescue Mission. 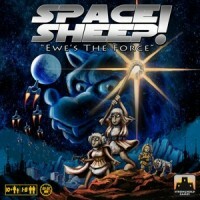 You know how to defeat Wolf – "Ewe's The Force..."
In Space Sheep!, you are Defenders in the Strategic Sheep Command (SSC) of the Lambda sector. A new race, known only as “Wolf”, has been found. Their message is clear: total annihilation of Sheepkind. The Flock Commander and the most elite Defenders are ordered into the latest “Shepherd” class ships with the mission of recovering all SpaceSheep, and returning them to their Home Systems via the complex hyperspace network. Unfortunately, SSC intelligence has determined that there could be members of Wolf in Sheep Commanders’ uniform secretly working against you. The Defenders only have limited time and resources to bring the SpaceSheep and Shepherd ships back home, thwarting the evil Wolf plans. Add a Review for "Space Sheep!"